Basically, the AF100 is what happens when you stuff the innards of a DLSR into the body of a video camera and slap some interchangeable lenses in front of it. Listing at $4,995, the AF100 rocks a Micro Four Thirds sensor that records to dual SD cards in AVCHD and outputs 8-bit uncompressed 4:2:2 video to an external recorder via an HD-SDI connection. 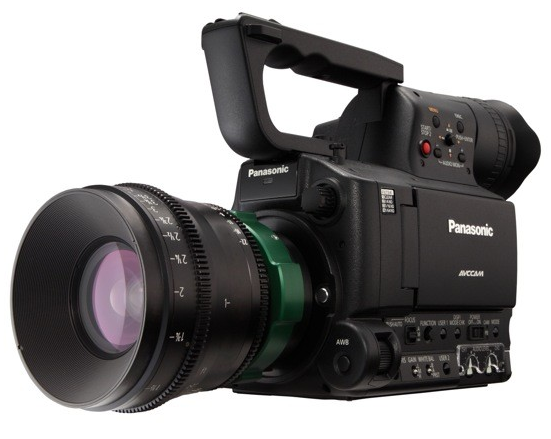 It also attempts to solve the audio issues plaguing DSLR video shooting (namely, the difficulty of getting pro-level audio to play nice with a camera designed only for imaging) with its two phantom-powered XLR audio inputs and built-in stereo microphone. Panasonic is also claiming to have lessened aliasing and the dreaded "jellycam" found in DSLR video with an optical low pass filter and faster scanning, while still boasting the wide viewing angle and shallow depth of field that movie-makers (and Vimeo users) know and love to death.